Move more air with this FanPak and a Moisture Medic. Together they will remove more air and cost you less money doing it. This FanPak™ is used with our Moisture Medic dehumidifiers to increase air flow in the crawl space, which makes the crawl space dehumidifier far more efficient and productive. 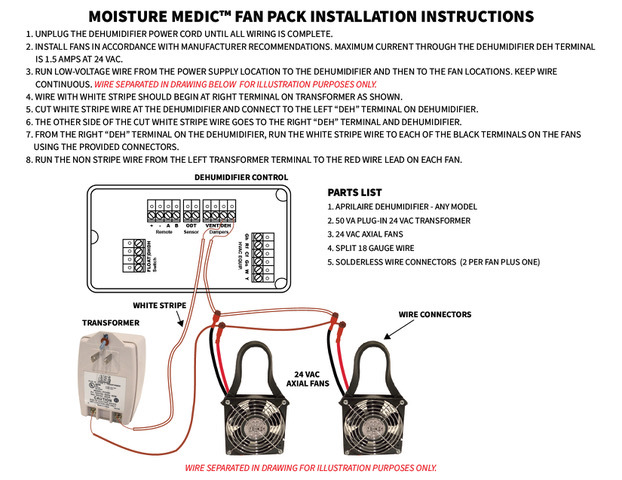 The FanPak™ will allow the Moisture Medic to dehumidify more area, by up to 50% more. More air flow means more dehumidifying, longer run cycles and a more efficient dehumidifier. Longer run cycles allow the dehumidifier to get to temperature and stay there while the FanPak™ continues to move the moist air toward the Moisture Medic. Ask to speak to a Tech for more information. FanPack™ is available in two options, 2 fans and 3 fans. The 2 FanPak™ includes 100 ft of 18 gauge wire (NOTE** the 2 FanPak™ can not exceed 100' with included wire. The 3 FanPak does not include wire. 3 locations can require more than a 100' installation, wire is not included. Wire sold separately on the 3 fan pack, 100 ft of wire is included on the 2 fan pack. Ask our tech team what size wire for the distance you will need on the 3 fan pack. 3 FanPak™ wire sold separately. Ask our techs what size wire you will need for the distance of the last fan from the dehumidifier.